It's so exciting when the small talk that lubricates social interactions with strangers turns into an excited discussion of space and science. I enjoyed one such conversation this morning with Ricardo (not his real name), the driver of the Uber car that took me to the airport. Sooner or later, a cab driver will usually ask: where are you headed? I always take great pleasure in being able to mention that I'm on my way to a meeting of scientists who will be talking about exploring the solar system. Most of the time, this is received with mild interest, but once in a while, the driver will respond that they're really interested in space -- and then he will ask a question. These questions almost always concern some conspiracy theory, and this morning was no different; Ricardo asked me about Niburu and Planet X. This is my favorite of the various space conspiracy theories because it is one of the easiest to pivot. 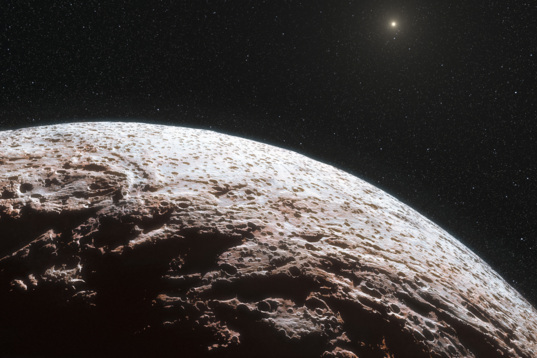 I respond that there's a lot of bizarre ideas out there, but underneath it all there's a kernel of truth: there really are almost certainly undiscovered planets beyond Neptune, and there are a few astronomers who are searching for them right now. Ricardo asks if those planets are causing wobbles in other planets, and I say no, at least not that we can detect, but that's how astronomers first discovered Neptune. And that there could be another Neptune way beyond, too far to make those wobbles, and who knows when we'll discover it? "Man, I really love this space stuff," Ricardo says as he's driving. "When I think about what might be out there, it gives me this feeling --" and he stops for a second, searching for words, waving one open hand in front of his chest as though it were expanding. He tries again: "It gives me this feeling, like I'm laughing, but it's not coming out, you know? It's just inside me." I grin, because he's passed this feeling right on to me. "It's so exciting," I agree. We converse for a few more minutes. "I love the conspiracy theories," he tells me, "because I like to be scared." I laugh and tell him there are things he should really be afraid of, like an asteroid that could hit Earth, and he said, "I know, like that Russian meteorite, I mean, I can't imagine how it was so big, it broke all those windows!" Here's a guy who's interested and paying attention and making connections. I find such people all over the place -- my plumber, a really smart businessman who's interested in space policy and the economics of human spaceflight, and the colorist at my salon, who has a telescope that she sometimes sets up on the balcony of her apartment. I hope that those of you who share my passion for space and science in general are open to these kinds of encounters. It's crucial not to make assumptions, like assuming that girl dyeing my hair must be so superficial, she probably doesn't care about what's beyond her -- turns out that girl can teach me a thing or two about deep-sky astronomy. It's also crucial to listen to people, to read what it is they're interested in, before engaging them. Science is about following one's curiosity; education too often forgets that, delivering science as facts rather than a process of asking "why?" and "how?" and trying to answer those questions. I love engaging people and then letting them lead the conversation, finding out what motivates their interests, giving them a few answers, but also sharing plenty of the fun questions that we don't have answers to yet, and talking about the exploration that we're doing right now to try to answer those questions. How to handle it when people ask about conspiracy theories? Sometimes, as with Ricardo, they recognize the conspiracy theories to be basically just science fiction, but enjoy their what-ifs anyway. Then, it's easy to maneuver the conversation to the just-as-enjoyable what-ifs that drive current scientific research. Other times, as with a parent of a daughter's classmate I met yesterday, they are really convinced about Area 51 and the Moon Hoax and whatnot. These conversations are harder to navigate, but it's important to recognize that you're not going to convert them with one conversation; all you can do is to try to sow a few seeds of truth. I reply with a little bit of defense (e.g. "scientists are truly terrible at keeping secrets") but mostly attempt to pivot to something real that's related to their area of interest, that might pique their curiosity -- what we're doing now to search for life on Mars, or how a new lunar spacecraft has captured amazing photos of the Apollo landing sites. People notice whether you're listening and responding to them or if you're just lecturing them; if you dismiss them out of hand, they'll dismiss you out of hand. If you listen to them, there's a chance they just might listen to you. All of this is why I adopted the second half of my official job title (the full title is "Senior Editor and Planetary Evangelist.") The word "evangelist" is heavy with connotations and is not one I use lightly. I use it to convey my devotion and passion to my subject, and what I consider my avocation to share it with the world, along with the belief that a respect for the cosmos and our place in it can make people's lives better. Some have expressed concern that I am equating science with religion. Of course, the two are not the same. They do have something important in common, though: they both represent attempts by humans to make sense of our existence. I choose to use the word "evangelist" to show that scientists can -- and often do -- feel the same sort of inspiration and zeal from the scientific process of seeking answers to those questions that the religious do when they see the world through the lens of their faith. Scientists have a reputation of being cold, clinical, distant, and in truth, some of them are. But a great many of us feel that same thing Ricardo did while he was driving me to the airport this morning: that inexpressible joy of discovering what a vast universe we're such a tiny part of. I want to take that feeling and share it with the world. Beautifully put. Too often, people suppress that elation, afraid they'll sound crazy or touchy-feely. Those in non-celebratory professions (e.g. plumbing, transportation, customer service) especially need that sense of community to keep their passion alive. I love your theme here of listening as a crucial part of the teaching process. It reminds me of my mentor's biggest piece of advice - "Teach gently." Emily - I like you approach. I need to remember and apply it. I appreciate your article very much Emily. For years though, for me, I kept science and faith light years apart leaning heavy toward science only. I have recently however experienced a personal change and moved over to faith, but I took my connection to science with me. Now I see no reason to keep the two apart. They go together for me comfortably, both receiving the same respect and joy in discovery and learning. I'm very glad you're out there doing this, Emily. Maybe one day you could write something about what the rest of us can do, too!